← Castro Valley Dispatch: Home Sweet Home! 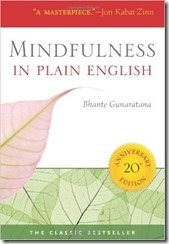 Book number one in my Summer Reading Challenge was Mindfulness in Plain English by Bhante Henepola Gunaratana, a book recommended by a friend. Earlier this year I started practicing mindfulness meditation. I was telling my friend Sue about it and was pleasantly surprised to find out that she had started meditating as well. I use an app called Headspace which is a series of guided meditations designed to teach you about the practice. Sue takes a class and also started reading a book which she recommended to me, Mindfulness in Plain English by Bhante Henepola Gunaratana. It turns out that this book is exactly what I had been looking for. With chapters like “Meditation: Why Bother?” and “Structuring Your Meditation” and “Meditation in Everyday Life” Gunaratana clearly explains the principals of meditation, the benefits and how it is done. It’s a great resource for someone who is just starting out their practice. I started out reading this in big chunks like I would with any book. While I did enjoy the book, I found that reading too much of it at a time was overwhelming. Therefore I took Sue’s suggestion which was to read just small sections every day. It took a few months to get through this way but it worked out better for me. I was able to get more out of the book and incorporate Gunaratana’s guidance and many suggestions. Mindfulness meditation is in fact a Buddhist practice. Bhante Henepola Gunaratana is a Buddhist monk who was ordained at the age of 12. While he does get somewhat into the spiritual aspects of the practice, I did not find him preachy. If you are interested in learning more about mindfulness meditation or would like to develop and existing practice I highly recommend this book. It is currently back on my shelf but I plan to go back to it again and again. Because of this I give this book a Shrimp Coma Mrs. B. This entry was posted in Uncategorized and tagged Bhante Gunaratana, meditation, Mindfulness in Plain English, reading challenge. Bookmark the permalink.